Four new plays, music, and dance...and we are looking for audience member volunteers to share the stage with us in as actors with non-speaking roles! Dinner with music by Kaleb Braun-Schulz served 5:30-6:00 pm, show starts promptly at 6:00 pm. Enjoy delicious, homemade food and desserts, and made-to-order coffee and tea. Dance by Swords & Silks - Mankato (https://www.facebook.com/events/434201437319093/) will include silk fans and silk veils choreography. 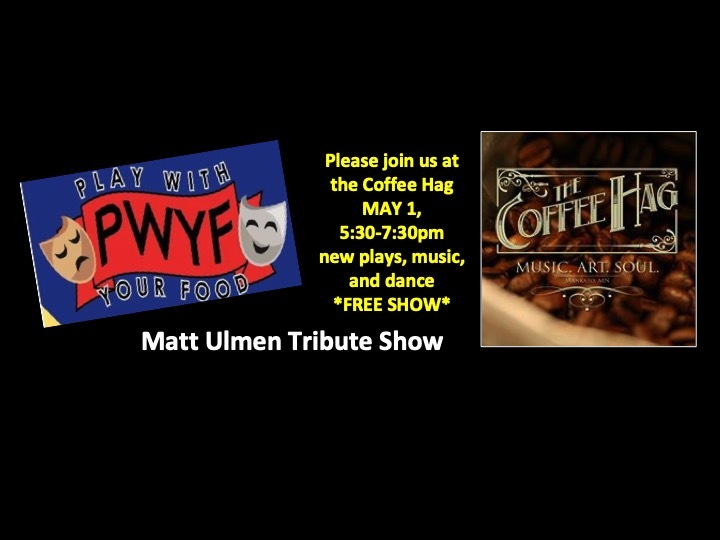 For more information, please see our Facebook page (https://www.facebook.com/PWYFmankato/) or event page (https://www.facebook.com/events/351297205729225/) email us at PWYF.openmic@gmail.com, or call/text 507-995-4392.